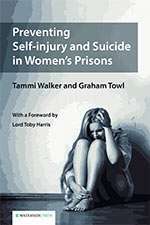 We are pleased to announce that Preventing Self-Injury and Suicide in Womens Prisons by Tammi Walker and Graham Towl is the Winner of the British Psychological Society Book Award 2017  Practitioner Text Category. The judgement criteria: "The Societys Book Award recognises excellent published work in psychology. The winning practitioner text is defined as a manual, reference or handbook, that has made a significant impact in expounding and promulgating an evidence based approach, to an area of practice of psychology".